There wasn’t much pain when I heard the popping noise from my ankle. It was mostly shock and disbelief. Here I was, hiking down the notorious Mt. 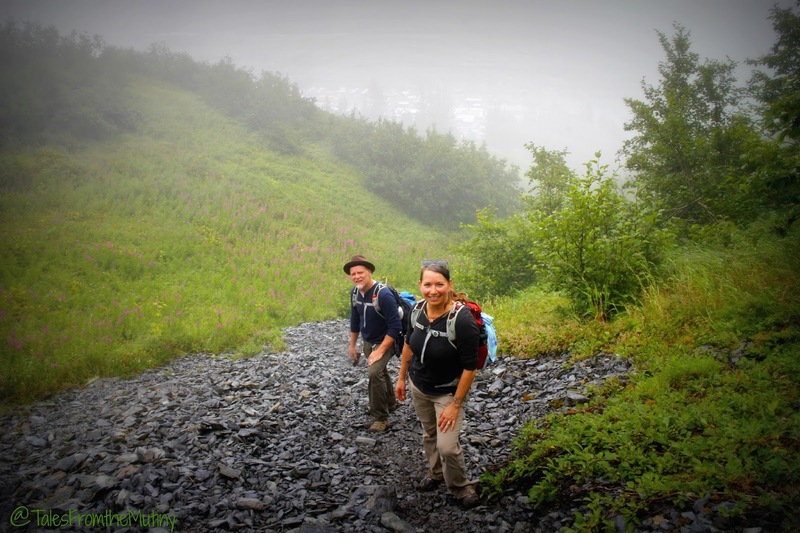 Marathon in Seward, Alaska with my husband, Clark, and friends, Nikki and Jason Wynn (fellow fulltime travelers from Gone With the Wynns), on a drizzly evening when I took that single, fateful step. Just a few hours before we’d climbed up the mountain, along with a hundred or so others, to watch a local band, Blackwater Railroad Company, perform a little concert (it was amazing!!). It was surreal. I mean, how often can you say you hiked 2 miles, gaining 2000+ vertical feet, to party on top of mountain with a bunch of other hikers? We were surrounded by an alpine meadow full of wildflowers and a waterfall taking in the experience…great music, dancing, dogs running and playing…it was an unbelievable scene. Up hill through the fireweed. 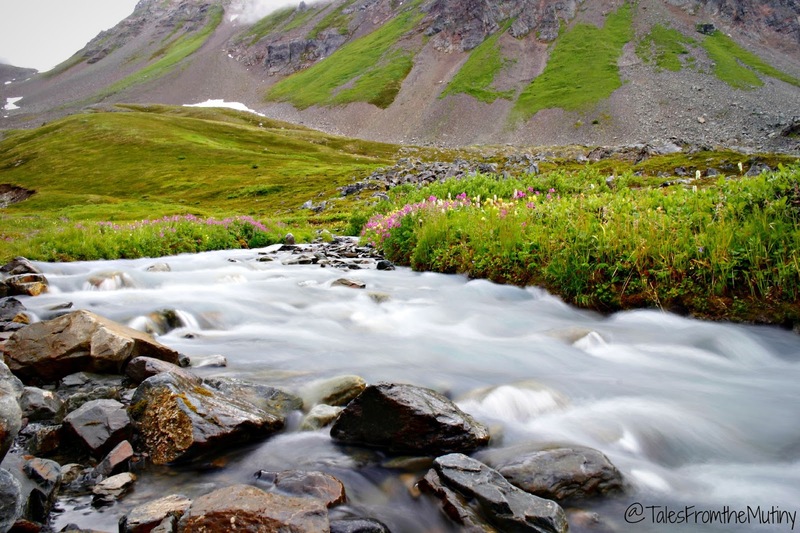 The stream and wildflowers at the bowl. The perfect setting for a great night of music, camaraderie and energy from fellow nature lovers. That was two weeks and two days ago today and as wonderful as that experience was what transpired afterward was one of the most amazing things I’ve experienced in my entire life. Once the concert ended we’d made it about a half mile down the shale face of the trail without trouble. The trail was wet and quite slippery. 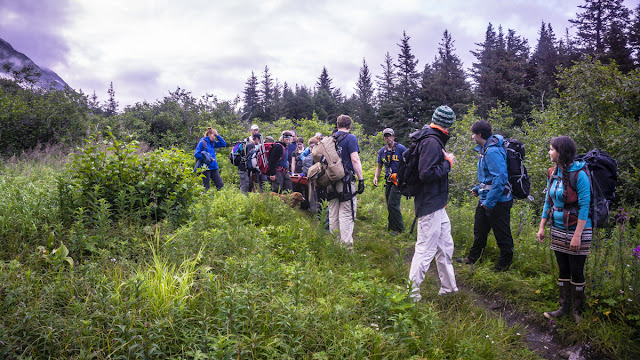 I’d already seen a few people with muddy butts and knew we still had another mile and half of pretty hairy footing before we were safely on terra firma. As careful as I was it still happened…my foot slipped off a root. There were 5-6 pops. 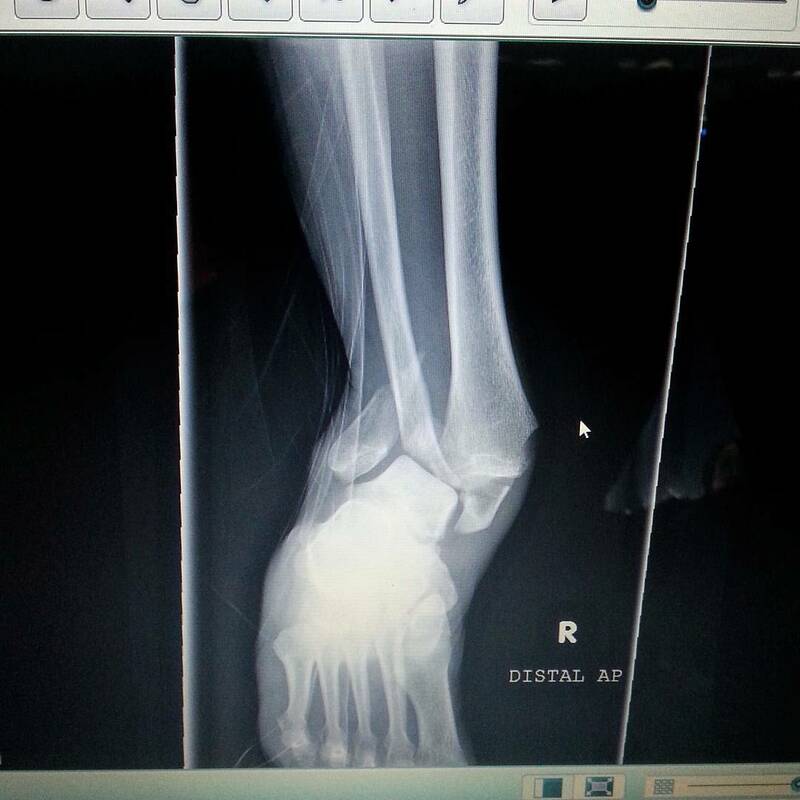 I grabbed for my right ankle and knew immediately that it was broken as my foot turned at an all too sharp angle. I sat down on the side of the trail as Clark ran toward me. I knew not to look at it…I have a “weak” stomach and was hoping to not embarrass myself by passing out. I was already berating myself knowing I just caused my husband and friends a huge inconvenience. How on earth was I going to get off this mountain? My other thoughts were 1- How will I ever be able to trust my body again if it can break so easily? and 2- I think I’m going to poop my pants…please God don’t let me poop my pants on top of everything else. All hands on deck! Getting tended to by some amazing people. But then something beautiful happened. Within minutes a man stopped to help. 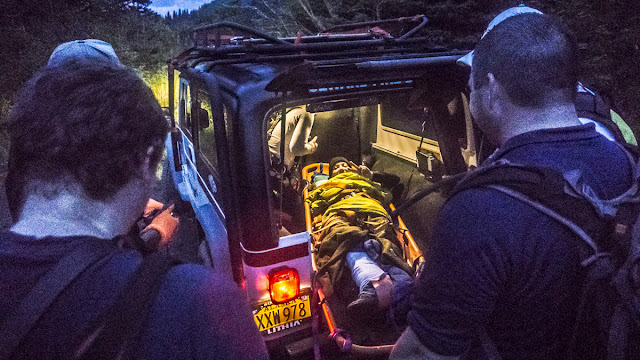 He identified himself as an EMT or mountain rescue (parts of the night are a blur) and immediately started to assess my injury. His dog, Lady, lay next to me, comforting me. Nikki and Jason didn’t hesitate to take charge of things too, directing other hikers to a side trail to avoid walking over me, and calling 911. In the meantime, Clark was by my side making sure I wasn’t freaking out and assuring me I’d not only get off the mountain but that the doctors would be able to fix me right up. Lady, and her owner, stuck by my side the entire time. I wish I knew her owner’s name…he was the first person to help me and the last to let go as I was loaded into the Jeep. I owe him a huge debt of gratitude. Then more people stopped to help. It seemed as though half the people who had gathered for the concert were either EMTs, mountain rescue, ski patrol, WFRS (Wilderness First Responders) or part of the Seward Volunteer Ambulance Corp. As great as it was to be surrounded by so many capable people I have to admit I got just a little tired of repeating what happened while they all proceeded to take my pulse at the broke ankle (ouch). One guy, Ben I believe his name to be, had been super prepared and had not just one but two splints in his backpack…as well as two wool blankets (even the other first responders were shocked…who brings splints to a concert??). While we waited for the rescue team to arrive with the stretcher I was very well taken care of by these, dare I say it…angels (even if some of them might have been a bit tipsy). Due to low clouds a helicopter was out of the question (darn it, I’ve never been in one of those). It took about 45 minutes for the Seward Volunteer Fire Department to arrive on scene. They were only able to drive their Jeep up the trail a mile before the rescue crew was forced to hike in. Once they arrived Amy (hero!) explained everything that would happen and how the rescue would take place. These men and women were going to painstakingly carry me off that mountain to where the Jeep waited. I was strapped onto the stretcher and prayed no one else would get hurt carrying me down to safety. That’s Amy…she’s a true hero. At times the trail was so bad people fell (thankfully none were injured). At other times it became so dangerous that instead of walking the stretcher down everyone would line up on the trail, plant their feet and then pass the stretcher through until there was better footing. 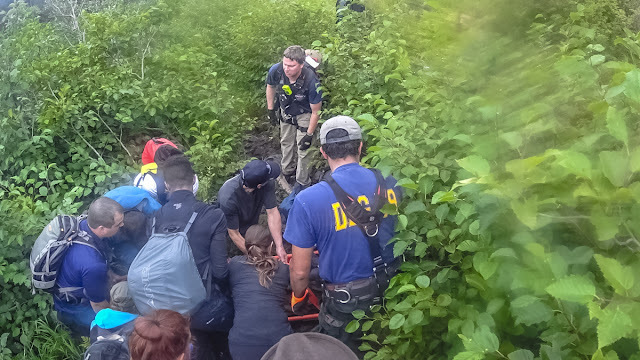 I later found out that some of the volunteers were actually helping to hold the other up so they didn’t slide off the mountain too. As I passed through all of these hands I couldn’t help but to stare into each face, offering my thanks as I tried to hold back tears of gratitude (okay, and maybe asking that they don’t drop me). 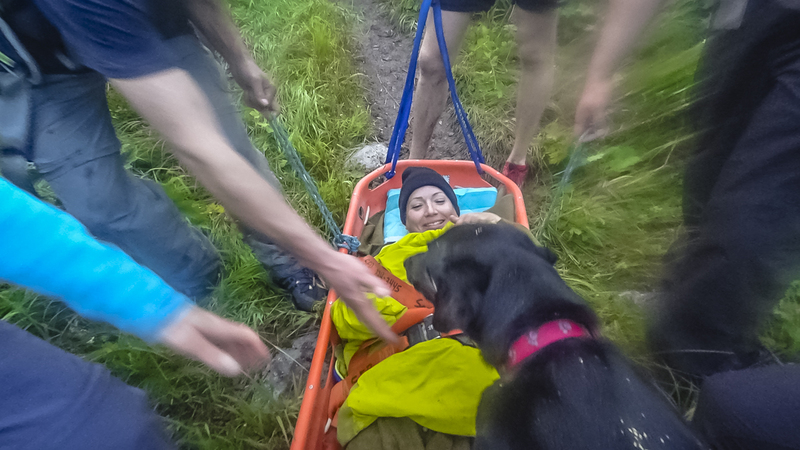 When first dispatched, the rescue team thought they’d be moving me down the mountain by themselves (there were 4 of them). But look at this scene…ALL of these people stayed to help! I love them all. Only a mile left…down the Jeep trail and into an awaiting ambulance. 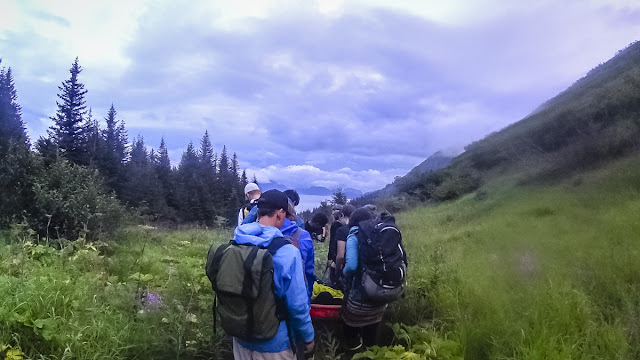 I made it to the Seward Emergency Room, a block from the trail head, 4 1/2 hours after the accident, arriving just after midnight. 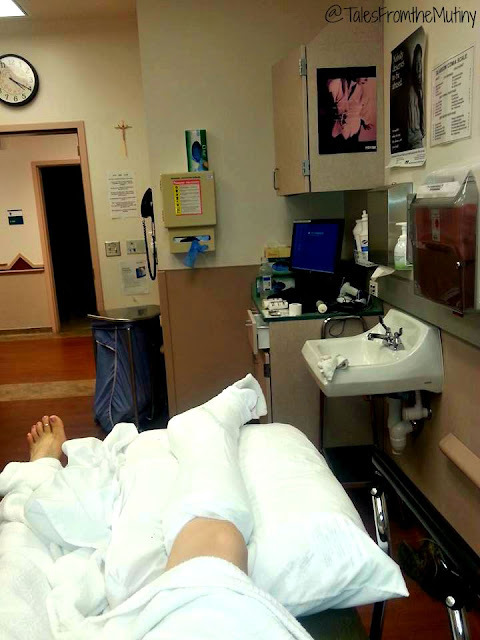 Although I had relatively no pain I was given and IV along with pain meds so they could assess my leg and take x-rays. Shortly after I was told that the damage was too severe for them to treat there and surgery would be required. The fog presented a problem as the medevac wouldn’t be able to fly until sun up. At one point the ER doctor got a little rise out of me when she talked about the possibility of a Coast Guard evacuation if it was necessary to save my limb. But it turned out I had plenty of feeling in my foot and since my pain level was low I would be able to rest somewhat comfortably until morning. My right ankle was placed into a plaster splint but no adjustments were made. I tried to sleep for the few hours I had before the plane would come for me. In the meantime, Nikki and Jason had gone to check on our pets (we had traveled by RV to Alaska and have two cats and a dog with us). Clark waited until we had some kind of game plane and then eventually went back to the RV to gather some of my personal belongings. Then he too tried to get some rest. 4:20am in the Seward ER…trying to get some rest before flying to Anchorage. 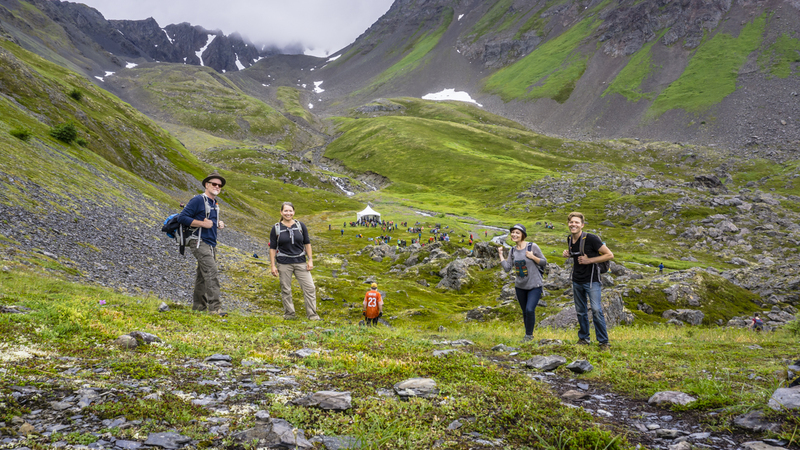 Some time after 9am the LifeMED arrived at the tiny airstrip in Seward. Once again Isaac, the singer/EMT, showed up to transport me via ambulance to the plane (apparently he didn’t sleep much either). 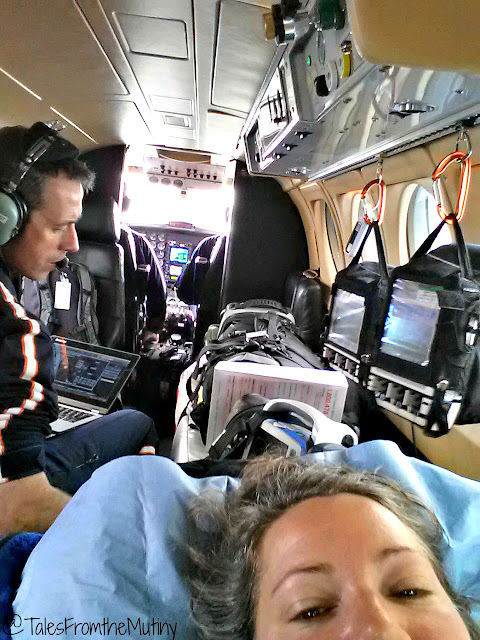 The amazing LifeMED Alaska crew and paramedics secured me in the back of a plane so small that not another person could have fit (I think there were 5 of us including me). They also gave me some pretty good drugs while I joked that this was some strange way for me to finally get an aerial view of Exit Glacier (not knowing that we actually would fly over it). One of the paramedics was nice enough to grab my cell phone and snap a couple of photos for me…and of course, I took a selfie in the plane. After all, it’s not every day you get airlifted in an emergency situation. Why wouldn’t you want to take a selfie while getting medevaced? 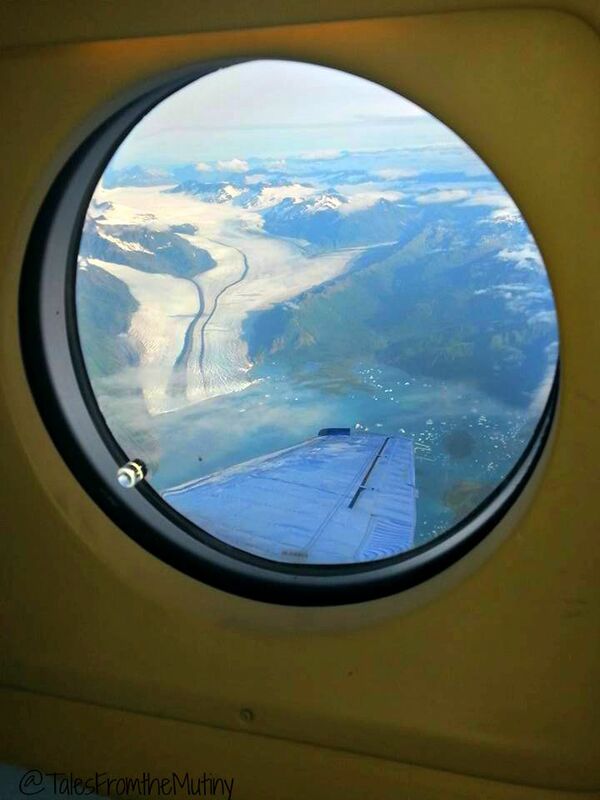 A view of Exit Glacier from the plane…hey, if you gotta endure the tragedy you might as well make the most out of it. My swanky room at Providence Alaska…I somehow managed to get the whole room to myself..and had some great views. It wasn’t really a private room but somehow they managed to keep me roomate-free until about 3 hours before I was discharged. It was wonderful. 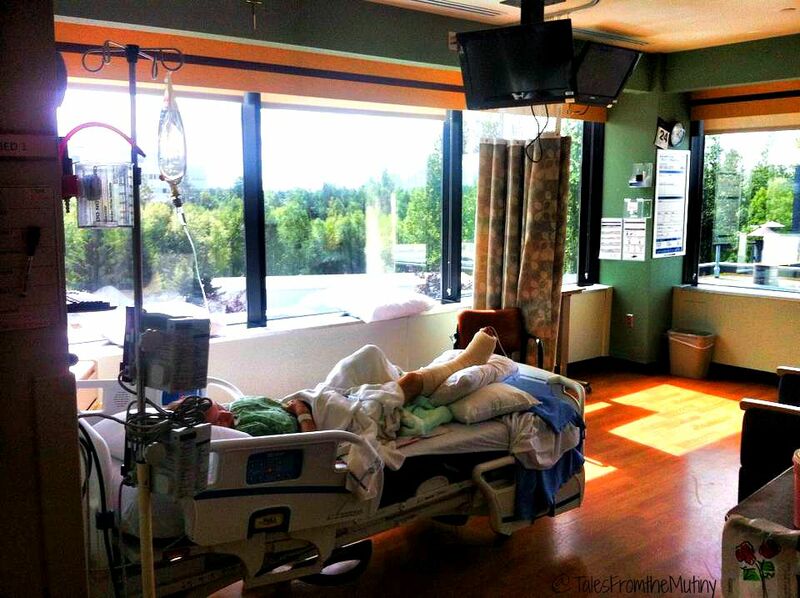 By early afternoon I was in a room and awaiting surgery. Clark had arrived and then went to get something eat and take a nap. The poor guy was working on less sleep than I was and he was still having to take care of everything. 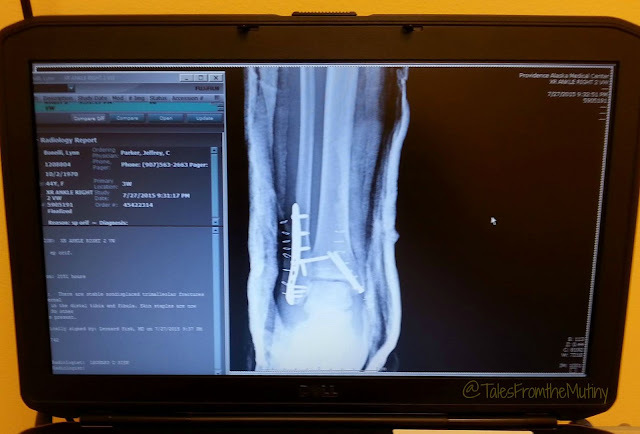 A little after 8pm, 24 hours after the accident, I was wheeled into the OR and underwent surgery where I received some screws and plates to hold my ankle together. A day later I worked with a physical therapist to practice with crutches, tackle some stairs and learn a few safe exercises which consisted of leg lifts, leg extensions, side leg lifts and leg curls on my stomach. I asked if I could add in a few simple yoga poses like cobra and updog (sans feet) and got the go-ahead. Two days later I was discharged with my very own crutches and a hundred ten pound splint. Prior to this I had never even been inside and ambulance. I had never broken a limb either. Suffice it to say I hadn’t been medevaced. 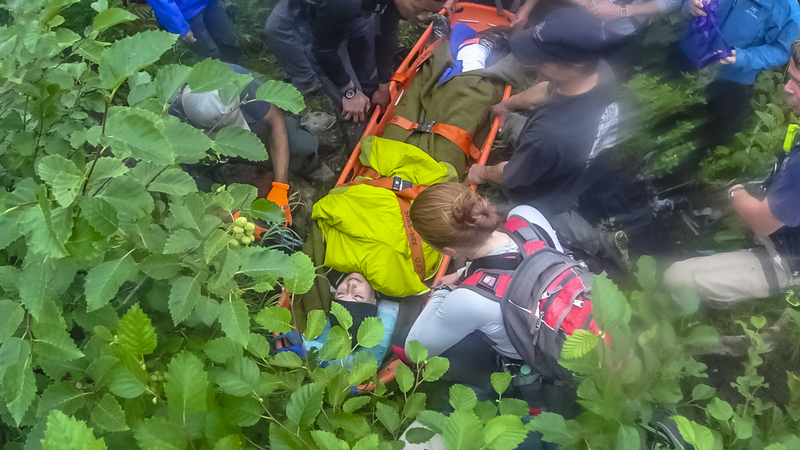 A few weeks before this accident, while in McCarthy, Alaska, a tour guide had said something that stuck…people come to Alaska to face their fears or challenge themselves in some way. I probably shouldn’t have taken his words so literal. I’ve received an amazing outpouring of love, support and prayers from hundreds of people…some of whom I haven’t even met (yet). I cannot begin to thank all of you for your care and concern. It is as humbling as it is heartwarming. Everything about this accident (aside from actually breaking my ankle) has been magical and all of the pieces have fallen into place (no pun intended). The story sounds too good to be true…an adventure of a lifetime, lessons to be learned, and faith in humanity restored all wrapped up in a crazy mountain top concert and rescue. I still pinch myself to see if it was all a dream. Alas, my aching ankle reminds me it isn’t. Now this is a good look. I’d like to take a minute to thank our friends and fellow RVers who helped us get through the first few days of this accident. Thanks to Jeanette and Eric of JenEric Ramblings for taking care of our animals and informing other friends of the incident. Thanks to Josh and Marie of Ardent Camper for visiting me in the hospital and bringing me gifts. 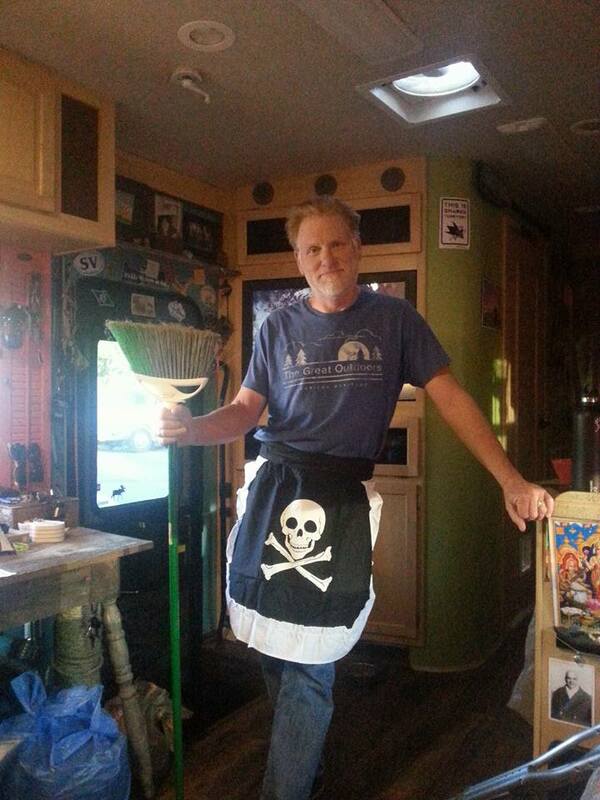 Thanks to Taylor and Beth Bank of The Learning Banks for the coffee, food and lovely apron for Clark…also for all of the generous offers to help us with household chores. A big thanks to Nikki and Jason Wynn of Gone With the Wynns for convincing us to go on this hike…I mean, for not only keeping your cool and calling 911 but for your help in literally carrying down that mountain, taking photos (despite the dirty looks from some of the rescuers), walking the dog and bringing me homemade lattes. Also, to my husband, who pretty much has to take care of me no matter what, I am still forever grateful for how he has unselfishly taken care of me. From buying groceries to cooking my meal, from helping me get dressed to washing dishes, and for holding me in his arms when I feel overwhelmed and sorry for myself…he has been my rock. Note: I’m posting this account to both my personal/yoga blog, Learning Curves, as well as my travel blog, Tales From the Mutiny. I’ll be writing additional posts for Learning Curves which will include seated and chair yoga sequences I’m able to do along with progress updates. In Tales From the Mutiny I’ll be posting more about our travels in Alaska, including all of the great adventures we had prior to this accident. Feel free to follow along either (or both) blogs. Lynn, your positive outlook in the face of such awful circumstances is a total inspiration to us. 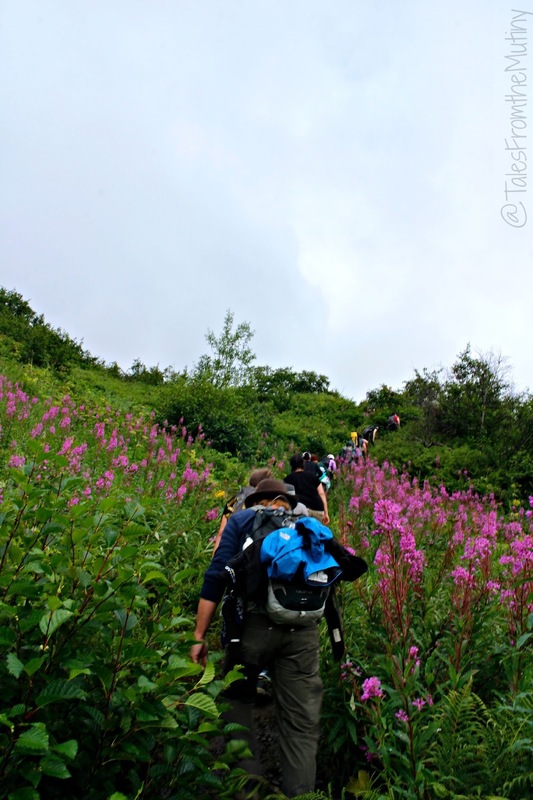 Josh and I are so glad to have met you and Clark this summer and spent time exploring Alaska together. So sorry this is the way the summer ended, but at least the story is pretty amazing–and you are too. We'll see you on the road soon!